"Football has nothing to do with fair play. It is bound up with hatred, jealousy, boastfulness, disregard of all rules and sadistic pleasure in witnessing violence: in other words it is war minus the shooting", stated George Orwell in his essay “The Sporting Spirit” in 1945. These bitter words could be easily applied to a recent football match between Serbian and Albanian national teams in EURO 2016 qualifier. The match, scheduled for October 14 2014 in Belgrade, was abandoned after the brawl caused by the appearance of a drone carrying the flag of the so-called “Greater Albania”. The game was supposed to be a fitting prelude for the historical visit of Albanian Prime Minister Edi Rama to Belgrade, first time after 1946. Instead, it turned into a disaster. Instead of showing how problematic relations between two states do not undermine new regional politics strongly devoted to the project of the membership in the EU, the match between two national teams displayed nothing but the nationalist violence in both countries. The situation eventually started to calm down a week after the match. After the days full of inflammatory rhetoric and heavy reactions from both sides threatening to cancel the scheduled visit of the Albanian PM, political leaderships of Serbia and Albania reached an agreement to postpone the meeting for November 11. And this is probably the only good news that followed the game. UEFA’s decision about the punishment for the two Football Associations is yet to be announced at the moment of writing this article. Still, however drastic the sanctions, it is clear that the events related to the abandoned match have almost nothing to do with football. To recap what happened that autumn night in Serbian capital: the organisation of the match between the two national teams involved heavy security measures and a strict ban for the supporters of Albania. The reason behind these unpopular measures with 3500 policemen securing the event is the unresolved conflict in Kosovo. Similar security policy was applied just a year ago, in September 2013, when national teams of Serbia and Croatia, the “old foes”, played against each other in World Cup 2014 qualifiers. The game started without any indications of potential incidents, the crowd chanting the “usual” insults against Albanians. Had the atmosphere remained the same, the game would have finished without significant incidents, perhaps. However, this was not supposed to happen. The match was interrupted before the end of the first half with the appearance of a small flying object – a drone – carrying a flag and map of the so-called “Greater Albania”, which includes, apart from Albania and Kosovo, parts of other neighbouring countries, Serbia, Montenegro, Macedonia and Greece. 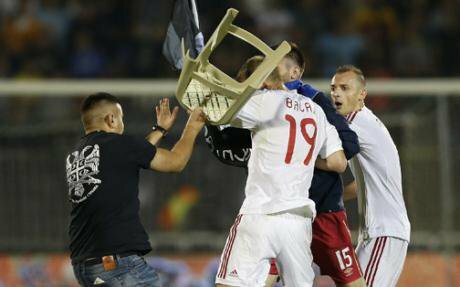 The brawl started after one of Serbian players managed to catch the flag upon its landing on the pitch, being subsequently physically attacked by members of the Albanian team who wanted to take the flag from him. What happened next was a huge fight that included not only players and team officials, but also the present stewards and fans who somehow managed to invade the pitch. One of the invaders was Ivan Bogdanov, perhaps one of the most notorious football hooligans in the world, “famous” for his role in the cancellation of a match between Italy and Serbia in Genova four years ago. The violent scenes that followed resulted in the Albanian national team taking refuge in the safety of the tunnel, while angry fans were throwing various objects on their heads. Serbian players tried to protect their Albanian colleagues, but it didn’t help much in the extremely heated atmosphere that pervaded the stadium. The epilogue was the abandonment of the match, pending UEFA’s decision on the penalties. Reactions that followed the match were somewhat predictable. Serbian and Albanian media competed in accusing the other side for escalating the incidents, while social networks burst with inflammatory rhetoric. The Serbian side highlighted the “terrible provocation” – the appearance of the map of “Greater Albania” that caused “justified discontent” among people, while the Albanian media insisted that the brawl showed the “barbaric and savage nature of Serbs”. Western reports offered explanations pertaining to the usual metaphor of the Balkans as a powder keg of Europe, where old nationalist enmities between Balkan tribes still escalate on regular basis. However, the hysterical accusation in Serbian and Albanian media, as well as orientalyzing explanations of what had happened during the game, don’t offer a framework for understanding the structural factors that once again made a Balkan football match good material for front pages in world media. With football on the back seat, of course. In this text I will not try to speculate on who caused the incident at the match and why, and who let Ivan Bogdanov walk freely on the pitch in the middle of the chaos. The key issue is how can one flag, however problematic, cause chaos at a football match and generate nationalist hysteria. Firstly, the events that occurred during the match between Serbia and Albania have a striking similarity with another famously abandoned football game that took place in May 1990, immediately before the break-up of former Yugoslavia. The game that was supposed to be played in the Croatian capital Zagreb at Maksimir stadium, between local club Dinamo and Red Star from Belgrade, didn’t even start, due to violent incidents on the pitch. This match soon became a sort of a myth, considered in Serbian and Croatian public narrative as the symbolical beginning of the war in former Yugoslavia, commonly recognised through the phrase “the war started at Maksimir”. In fact, the mechanism that followed both games was the same. Ethnically motivated incidents that escalated on the pitch triggered extreme reactions in the public sphere in both countries. In the “Maksimir” case, both the Serbian and Croatian sides were accusing each other for causing the brawl, creating the atmosphere of mutual distrust. This football match, basically, served as a cause for political actions that led to the violent break-up of the Yugoslav state. The match between Serbia and Albania induced similar reactions. Public space became full of the worst nationalistic stereotypes, with the sad consequences on the field. The cases of the attacks on the shops owned by ethnic Albanians in several Serbian towns, as well as the ethnically motivated violence against Serbs in the regions with Albanian majority, showed that the escalation of violent incidents by far go beyond the significance of one football match. Moreover, it was football again that opened the Pandora box of ethnic hatred. The titles in the Serbian media the day after the game seem self-explanatory: “Albanian security service organised the assault”, “Albanians set the Balkans on fire again”, “A devilish plan from Tirana”. The Albanian side followed the same pattern. The celebrations organised in many places in Albania and Kosovo and the ignorant attitude to the highly contested nationalistic symbol such as the map of the “Greater Albania” showed the same nationalistic drive as in Serbia. Extreme reactions that escalated both in Serbia and Albania, certainly, wouldn’t be possible if the cause was any other event but the football match. Once again, football displayed its capacity to homogenise the nation, at the same time showing how easy “the beautiful game” can serve as a trigger for unrestrained reactions that eventually lead to violence. Indeed, not only in the Balkans. The key to understanding the role of football as a trigger for the violent nationalism in the Balkans is the incident at Maksimir stadium in 1990. After these events football in the whole region became permanently and deeply contaminated by nationalised politics. Chants like “Kill the Serb”, “Kill the Croat, so that the Albanian won’t have a brother” and likewise, became a part of football folklore on the stadiums across the region. A good example of this attitude could be a comment made by reporter during the live broadcast of the match between Serbia and Albania. While the whole stadium was chanting “Kill, slaughter, Albanians to vanish”, his remark was that the crowd “express their discontent”. The football stadia, therefore, still remain a space for the expression of, let’s say, “acceptable nationalism”, where killing the “fags”, Croats, Serbs, Albanians, Moslems, Orthodox, is considered normal and desirable behaviour. Using ritual violence to insult and intimidate the enemy on the pitch represents a regular practice in football fans’ subculture. However, the incidents that occurred at Maksimir stadium in 1990 or during the recent match between Serbia and Albania, indicate how easily this ritual violence can turn into the real one. When ritual, verbal insults transform to actual violence followed by setting fire to houses or shops owned by “the enemy”, it goes far beyond “usual” stadium enmities. What happened last week in Belgrade represents a very dangerous political manipulation, where football stands as a stage for causing chaos without obvious reasons. Responsibility for the violent events lies with the Serbian and Albanian side, as well as the UEFA. The essential message, however, is that inflammatory atmosphere created around one football match could easily serve as a trigger for an unpredictable instability. It seems that this time, luckily, things were eventually brought under control. It is obvious, however, that manipulation with nationalist sentiments still works around the region. And it could be repeated again, next time with much worse consequences. The drone flying over Belgrade stadium may not have carried a bomb, but a symbolic explosion caused by its load was loud enough. In the region where economic and social situation, caused by neoliberal economic agendas, is reaching a collapse, the turn to the right wing and nationalism could make things only worse.